I’ve got some jazzy new boots! My old boots were a common-looking pair, black rubber with red toes and heels, bought at the Farmers’ Co-op. They were loose enough for me to double my socks for winter and also stuff my flannel lined jeans, over a layer of long johns, into the boot. 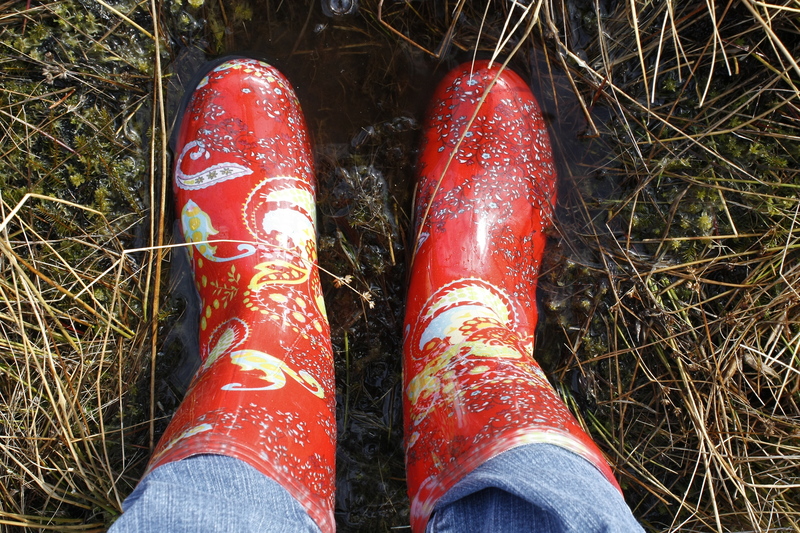 They were my “all season radials” for getting around the farm, walking the dogs in the woods, fording the spring run-off across the road by the flooded pond, picking up eggs in the chicken coop, and mucking about in the garden. They were good, if unglamorous, boots, ultimately practical, as am I.
Alas, this winter, they cracked just above the sole and started to leak. 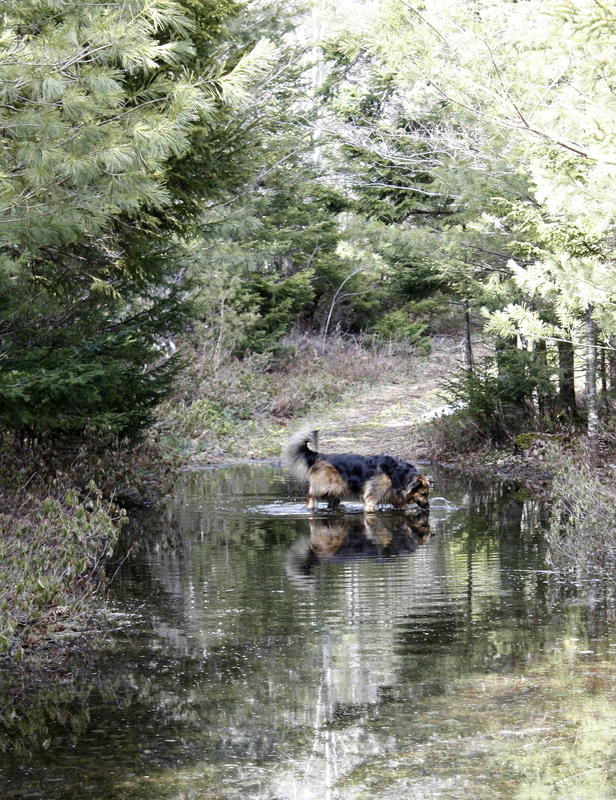 Not a problem in snow, but in puddles along the woods trail they were not up to snuff. I kept coming home with soggy socks. I had considered a duct-tape solution but Edward shook his head, “uh…no,” was all he said. Not sure if he thought that was plain tacky or if he believed it either wouldn’t work or would have problems attached, like having sticky bits collecting gunk around the edge of the tape. He was encouraging my new boot purchase, so the other day we went to Wile’s Lake Farm Market, on the road between our place and town, and I bought a pair of “Sloggers” rubber boots they had on sale. Wile’s Market, by the way, is one of our signs of Spring. When they close in November for the winter they post their Spring opening date on their sign, and it becomes a kind of time marker that people in the area count down to. When the market opens, it must be Spring! I am a low-key kind of gal, conservative in my clothing, favouring blues and browns, a touch of green or dark purple now and then. They had some green and blue boots with paw prints on them which made sense for dog walking. But I decided I needed a change, something more playful, and I grabbed a pair that were a bright red paisley print. It felt like I was stretching myself in some small way! I like my new boots very much, but my practical side says they won’t do me for next winter as I can’t get my double pants stuffed in the shaft. In any event I can now deal with the big puddles from Spring run-off in the woods as I walk Angus and Alfie, and cope with the mud around the gardens. The muddy paws that come with the season are another story. And Alfie, a.k.a. Swamperella, has begun her daily swims in the pond as the ice retreats. So I have to factor in extra time when we get home for lots of toweling-off and rinsing of toes, especially her fluffy ones. Angus’s seem to be made of Teflon, not much sticks to him. Another sign of Spring around here is our Newcombville Nick sighting. You’ve no doubt heard of Puxatawney Phil if you’re from the US, and Shubenacadie Sam if you live in Nova Scotia, the famous groundhogs who are supposed to be the predictors of whether Spring will come early or late (or still on March 21 as the calendar says!) Well, Edward and I have been watching our for a groundhog who lives in a hillside nearby, across from the local Fire Hall. Every Spring we keep our eyes peeled for our first sighting of him popping out of his hole as we drive by, praying that he hadn’t been run over by the hay mower in the fall or frozen by a bad winter. And there he was, last week, around the time Wile’s market opened on the 2nd of April. The snow was finally off his hill and he got his head above ground. “Yay! Newcombville Nick!” we yelled passing by, like a couple of excited children. We applaud him for not being so silly as to come out on February 2nd and make ridiculous predictions like those famous groundhogs do. He has the good sense to stay cosy in his burrow until Spring actually gets here. 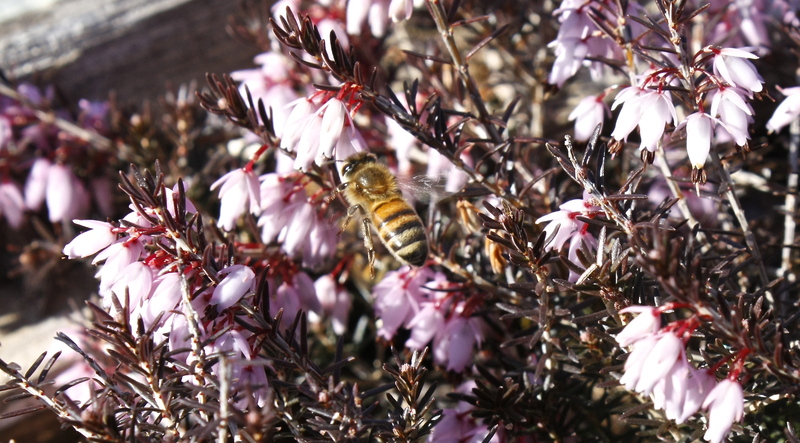 Spring’s arrival on the farm includes sightings of bees coming out of our hives. Another “Yay!” Some of them have made it through that horrible winter, looks like only two hives of four. It hasn’t been warm enough to open them up to peek inside yet, but there is only traffic flying from two of them. Not much for them to feast on yet really, maybe when the alders release pollen, perhaps they can use that. And a wee patch of heather has just bloomed and they are already enjoying it. Note to self (or to Edward), “plant more heather”. It is still very cool here and seems a while before any other flowers will emerge. I’m not sure our forsythia is going to recover from having it’s fattening buds encased in ice in a recent freezing rain storm. Friends had already been taking cuttings inside to force before the ice happened, and our buds don’t look quite right now. The storm made for a magical landscape for a day. And then there is the glee of the chickens, who have been “cooped up” all winter due to the piles of snow and ice and frigid temperatures outside. They are so happy to get out in the fresh air and dig in the dirt to eat worms and bugs and grass. The egg yolks will be getting more vibrantly yellow as they transition from mostly grains to green grass as the season progresses. They actually look a little more stunned than gleeful here, maybe still in shock at getting outdoors for a full day! And today, finally, in the place at the back of our woods we call the Cathedral, the snow had melted to reveal my stone circle again, which has been almost completely covered for months. Through the winter I had to guess at the location of the stones as I said my prayers and gratitudes and sent Reiki into my day… at least, on the days when the snow wasn’t so deep and soft that I turned back before making it all the way to trail’s end. I am so happy to be in that space again, even though I was there many times in the snow, I love seeing the stones, nothing fancy, just a circle of melon-sized granite and slate rocks I had found in the woods. They offer me a container in which to be still, if even for a minute, before the dogs grab my attention again. But usually the dogs stay very still or wander quietly nearby when I am there. It’s where I send intention into my day, where I ask for help and guidance for myself and others. It’s where I slow down enough for a moment to be present to what is, with no distractions, no computer, and no to-do list. And usually the present moment in that space is beautiful and peaceful and happy. Sometimes I don’t want to leave there, to have to start making choices again and being responsible and responding to others. And then I realize I can take that feeling with me, that sense of presence and awareness of what is, now, and how good the now is, and know that that awareness is only a thought away. Sure the Cathedral and the stone circle make it easier because it is a simplified environment. But the reality is, it is ultimately my choice to make that a sacred space for me. While inherently beautiful in my view, another person could just as well find it uninteresting, just a place to be bug-bitten or scared of coyotes, or to haul out their iPhone and see if they can make contact back there. Or simply be so much in their story of the past or their worry for the future, that presence is impossible. So I have realized I can bring my sacred space with me, in me, wherever I go. I can create my own container of intention and present-moment focus, and decide to bless myself and others and go into my day in peace, no matter what is going on around me. Theoretically at least! Some days it works, some days I get derailed, and find myself uncomfortable, worrying and doubting when I am stretching my habitual boundaries. 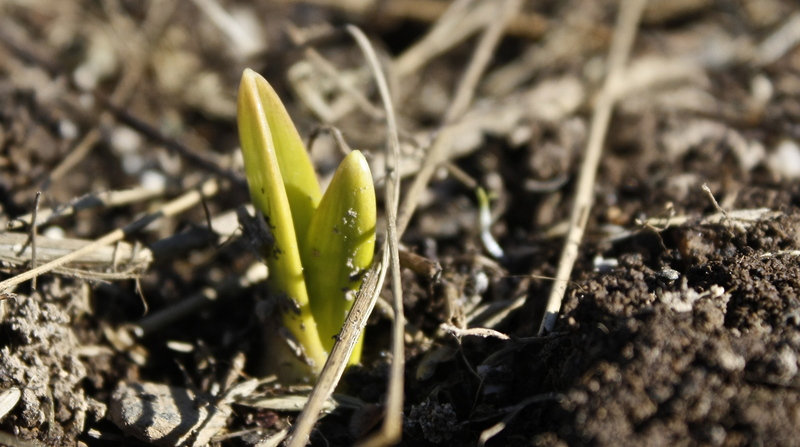 Springtime is all about renewal, rebirth, new growth. I wonder about the force it takes for tiny green shoots to push themselves up through the ground, to “self-actualize” if you will. For them it is automatic, just following their life-force, their genetic programming I suppose. For us to self-actualize, to grow into our best selves, it sometimes feels like there are a lot of rocks in our ground to push through or to go around. It feels anything but automatic. Our bodies might grow from genetic pre-programming, but our minds, our creative visions, seem only hampered by early programming, genetic or environmental. When we feel the tug of our soul’s calling, it seems to take a lot of extra effort to follow that call, a constant re-aligning with our values and inner knowing in order to break through fears and other patterns. Seems interesting that this challenging time is corresponding with our Spring time (at least here in the northern hemisphere! I guess I’d have to get more creative connecting these time periods if we were talking about Fall.) But I know that at least for myself and some friends lately, we are being called upon to stretch beyond our perceived limits, to get uncomfortable for a while as we create new realities for ourselves, upping our standards for who we want to be and what we want to achieve in the world and our careers. Yup, I feel like a tender green shoot some days, pushing my way out of the dirt of old beliefs and expectations and self-concept. There are always a few grains of soil that cling on. Maybe that’s why I bought the red paisley boots instead of some good ol’ Co-op ones. A tiny external shift to mirror and support my inner shifts, taking a symbolic step into something new and brighter and more fun. Putting a “spring” in my step! ← Death, Dogs, and the Triad ~ Lessons in emotional mastery.